The Rainbow Light Body Essences are very high frequency, finely tuned clearing and activation tools designed to assist in the development of your Light Body or Mer Ka Ba. Each of the essences in this set was created by a unique process that included the use of grid layouts of special crystals programmed with light body information by the Sirians at the fall of Atlantis, together with channelled Rays of energy from the Ascended Masters. The result is a set of twelve very powerful essences that provide exactly the support we need now as we seek to assimilate higher & higher frequencies of Light into our energetic systems. Mer Ka Ba means Light, Spirit and Body and is a term used to describe the result of the fusion of these three elements that occurs naturally when the frequency of our physical, etheric, emotional and mental bodies resonate fully with Light and Love. At this point in our development the activation of our Mer Ka Ba or Light Body becomes possible. This can be seen as a body of light in the shape of a Star Tetrahedron and becomes our vehicle for multi-dimensional travel. The geometric shape of the Star Tetrahedron is a combination of the five platonic solids, Hexahedron, Tetrahedron, Octahedron, Dodecahedron and Icosahedron. These five platonic solids form the patterning of the original blueprint for human life on Earth. From this we can see that the original blueprint for the human form included the complete integration of spirit and matter within its make up and is a natural part of our evolutionary path. Our ability to activate our Light Body is dependant upon our ability to allow our energetic and subtle bodies to completely resonate with the Light and Love of higher consciousness. Each of the powerful essences in this set of twelve will assist you to clear, balance and activate a particular subtle body or energy point and bring you closer to the activation of your Mer Ka Ba or Light Body. Try 4 drops on tongue once per day of one essence only. See the effects. If guided try it twice per day. It is advised not to use more than 2 doses per day unless specifically guided. 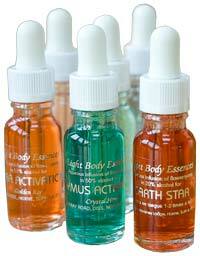 These essences activate very quick and powerful clearings through all the dimensions. For best results take straight from the stock bottle sent, do not dilute. It is better to take essences at least ten minutes away from food. If you need any help or advice with choosing or using the Rainbow Light Body Essences, please see our Choosing An Essence page or you are most welcome to contact us if you would like to speak to someone.